The leading clinical examination performed in the nuclear cardiology laboratory is the Nuclear Stress Test (Myocardial Perfusion Imaging). 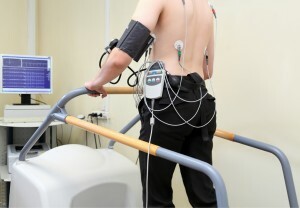 The reason for an exercise cardiac nuclear stress test is to assess the blood flow to the heart muscle when the heart is at rest and then under stress (exercise). A nuclear stress test allows our doctors to view pictures of your heart while you are at rest and then under stress after you have exercised. The test can reveal how well the heart is pumping blood, the size of the heart’s chambers, and if the heart has any damaged or dead muscle. Nuclear stress tests can also provide information about your arteries and whether they might be narrowed or blocked from coronary artery disease. Prior to starting the exercise, a small intravenous (IV) line will be started in a vein in your arm or hand. The IV will permit us to inject the Cardiolite (radioactive tracer) into the bloodstream at the appropriate time. Two injections are administered one under rest conditions and the second under stress conditions. If you are unable to exercise medications that reproduce the effects of exercise on the heart will be given to you. The injected tracer is taken up by parts of the heart muscle receiving normal blood flow. If there is a blockage in the heart, those areas will show as decreased uptake or absence of the tracer. Images are obtained with use of a very sensitive Gamma Camera that creates still pictures of the heart. These pictures are displayed in 3-d format.The test lasts approximately 2 hours. The findings of the nuclear stress test can reveal if the heart is not working properly when you are resting, exercising, or even both. If the test shows that blood flow is normal when you are resting but abnormal when you are exercising, then our cardiologists will know that your blood flow to your heart is not sufficient during periods of stress. The heart normally pumps more blood during periods of physical activity. If the test results are abnormal during both segments of the test (rest and exercise), then part of your heart has been scarred or permanently deprived of blood. If doctors can’t see the radioactive material in a portion of your heart, it most likely means that a segment of the heart muscle has died, either because the coronary arteries providing blood to that area of the heart are blocked or because of a previous heart attack. These highly accurate images will enable our cardiologists at First Coast Heart & Vascular Center to determine which medications to prescribe and determine if further testing like a coronary angiogram is necessary, or the need for angioplasty and bypass surgery, or devices to optimize treatment outcomes.